The Swedish capital of Stockholm is a popular destination for tourists, but it's also close to several other major cities like Uppsala, Gothenburg, and Norrköping. To get from Stockholm to Uppsala (or from Uppsala to Stockholm) while in Sweden, you have a few transportation options, each with pros and cons. Public trains take about 40 minutes while buses are slightly more expensive and run less frequently, taking about 90 minutes to complete the trip. Alternatively, you can also rent a car to drive the 44 miles between the two cities, which takes about 50 minutes with light traffic. There are no available flights between these two destinations. No matter which way you choose to travel, be sure to take in the sights and attractions and plan your trip to allow plenty of time in both cities. Uppsala Castle and Cathedral, as well as the Linnaean Garden and Gustavianium Museum, are popular destinations in Uppsala while the Stockholm Palace, Gamla stan, and the Vasa Maritime Museum are among the most popular attractions in Stockholm. Taking a train to Uppsala from Stockholm is by far the best option as it provides a more flexible schedule of services, cheaper tickets, and faster travel times in well-maintained passenger cars. However, you may want to reserve a rental car to allow more flexibility with what you see between these two southern Swedish towns. Train services are part of the public transportation network in Sweden, which is why they're slightly cheaper than privately-owned bus tours, and you can purchase tickets on the Swedish Railways website. From the Stockholm Arlanda Airport (in the middle between Stockholm and Uppsala), the 23-mile journey (37 kilometers) takes only 20 minutes but costs more. Buses run between the cities of Stockholm and Uppsala, but there are fewer departures than the train connection. It’s about 63 kilometers (39 miles) between the two, and at 90 minutes, it’s the slowest option and somewhat higher priced than the train. If you'd like to rent a car, it makes for a very nice drive; simply take E4 north and you'll reach Uppsala after 44 miles (71 kilometers) in about 50 minutes. There is no air travel available between Stockholm and Uppsala, so getting to the latter requires taking at least one form of alternative transportation. However, since Uppsala is so close to Stockholm, it makes for a great day trip or weekend getaway from the capital. When traveling to Uppsala by bus or train, you will most likely arrive into Uppsala Central Station, a newly remodeled central hub featuring shops, restaurants, and stores for both the local and national train services. Overnight accommodations are available in Uppsala, but if you're just making a day trip, there are more options for hotels in Stockholm that are generally cheaper and more readily available. 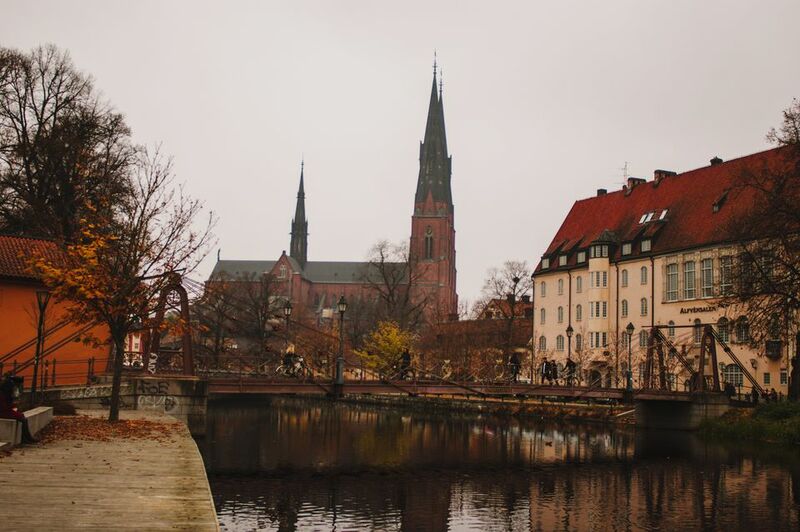 However, since Uppsala is the fourth-largest city in Sweden and a college town, there are plenty of hotels to choose from there—if you book far enough in advance, especially during the busy tourist seasons.